Photo: Looking east to Ex Coelis Mountain from Highway #11 (l-r) Normandy Peak, Ardennes Peak, Rhine Peak, Elbe Peak at the site of the monument. 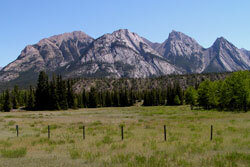 Ex Coelis Mountain is a complex feature with five peaks. Referred to as Kadoona Mountain by Mary Schaffer, the name was not formally adopted and the feature was officially named in 1994. Ex Coelis is Latin for "Out of the Clouds" and is the motto of the First Canadian Parachute Battalion, one of eight battalions which made up the Sixth British Airborne Division during World War II. When the mountain was named the battalion association's president referred to the peaks as, "A bold memory of jumpers buried on foreign soil." When the invasion of France began on D-Day members of the battalion were among the first Allied force on the ground, taking off from their base at 23:30 and landing in France shortly after 01:00 on June 6, 1944. The unit had orders to demolish a bridge over the Dives River, thus hampering any German advance to the invasion beaches, and then to cover British paratroopers attacking a coastal artillery battery which was thought to threaten the beaches. They accomplished these tasks but with the loss of nineteen killed, ten wounded, and 84 taken prisoner. The large proportion taken prisoner occurred because many of the paratroopers became isolated when they landed far beyond the intended drop zone. In 1997 names were assigned to the five individual peaks of Ex Coelis Mountain. Normandy Peak, Ardennes Peak, and Rhine Peak were named after battles in which the battalion participated. Elbe Peak was named after a river in Germany near the point where the battalion met the Russian Army which had been advancing from the east. The fifth, Stan Waters Peak, was named after a battalion member who had an outstanding career both as a soldier and businessman. Stan Waters joined the Calgary Regiment (Tank) in 1940 and, while serving in the First Special Service Forces (also known as the Devil's Brigade), was awarded the US Silver Star for gallantry in action in Italy. Serving as a major and temporarily in charge of a casualty-stricken battalion, Waters walked under direct fire to co-ordinate his infantry unit with as supporting tank regiment for a successful attack on an enemy-held mountain village. Later, he commanded the first battalion to liberate Rome in June, 1944 and in 1945 saw action as a company commander with the First Canadian Parachute Battalion. After the war, Waters helped pioner Canada?s emergence as a peacekeeping nation, serving in a variety of roles with the United Nations and NATO. After retiring from the military in 1975 with the rank of Lieutenant General and in command of the entire Canadian Army, he had a successful business career and was involved with a wide variety of community service organizations in Calgary before being appointed to the Canadian Senate. In September, 2000, a monument honouring the Battalion was unveiled at a viewpoint parking area off of Highway #11 near the mountain.